Task Force Arrival and Departure - "British Avon" was the first tanker back to the UK to reload, and arrived at Portsmouth on Saturday 5th with the special prisoner Lt Cmdr Astiz who was shortly flown back to Argentina as a POW. Next day, but across the Atlantic, a second repair ship "Stena Inspector" set out from Charleston, South Carolina after a conversion which included the addition of a heavy machine shop. Ascension - More ships passed by during the week on their way back to Britain including "Queen Elizabeth 2", but aircraft, equipment and supplies were still urgently needed in the south. With a total of nine Harrier GR.3's of 1(F) Sqdn RAF now present, two flew direct to the TEZ on Tuesday 1st and landed on "Hermes", and another four, together with two 3 CBAS Gazelles and the local RAF Chinook sailed on Thursday with the helicopters already on board transport "Contender Bezant". Two more GR.3's flew on south the following week, but the ninth stayed behind with fuel leaks. Wednesday night saw the launch of "Black Buck 6", the second successful Shrike raid against the Stanley radars, but this time the Vulcan had to divert to Rio de Janeiro on the way back. South Atlantic - During the week, as 5th Infantry Brigade was landed at San Carlos, more ships of the original Task Force started to return north. Frigates "Alacrity" and the damaged "Argonaut", after spending a short time in the TRALA with "Stena Seaspread", followed over the weekend in the wake of "Glasgow" bound for the UK. Going in the opposite direction, the three tugs stationed in the area made their way to South Georgia. By then, RFA "Fort Grange" had joined the CVBG to start replenishment operations and helicopter support ship "Engadine" was entering the TEZ on her way to San Carlos Water. Earlier in the week, "Iris" also reached the TRALA with the scrap steel from South Georgia and then along with "Dumbarton Castle" continued her despatch duties between the Falklands, South Georgia and Ascension. Carrying casualties of both sides, the Red Cross Box/Montevideo shuttle now started in earnest. On Wednesday 2nd, as "Hydra" followed her north, "Hecla" arrived at the Uruguayan capital and by Sunday was back in the Box. In the meantime, "Herald's" Wasp was used to carry an International Red Cross team over from "Uganda" to inspect the Argentine icebreaker "Bahia Paraiso" now being used in the hospital ship role. South Georgia - As the only secure base where stores could be transferred between ships with little interference from Argentine aircraft, there were more arrivals from the TEZ. 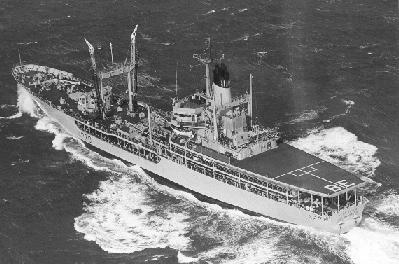 These included RFA "Resource" which called in for replenishment herself, destroyer "Antrim" returning this time as guardship, and RFA "Pearleaf" to take over as station tanker from the departed "Blue Rover".